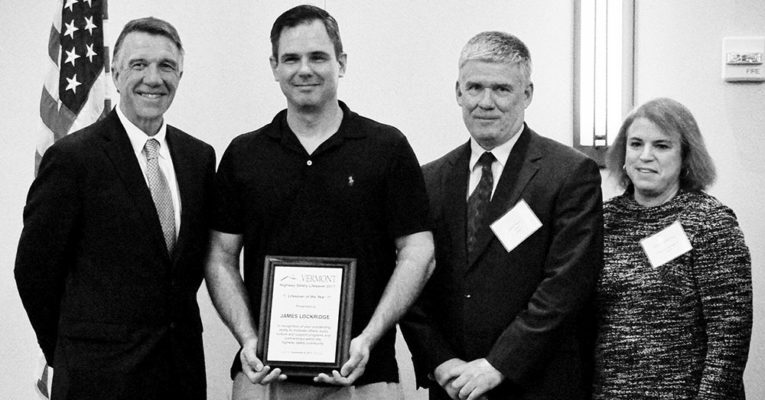 The Governor’s Highway Safety Program recently presented its annual ‘Lifesaver of the Year’ award to James Lockridge, Executive Director of the Youth Safety Council of Vermont. The award was presented by Governor Phil Scott, GHSP Chief Keith Flynn, Vermont Motor Vehicle Commissioner Robert Ide and GHSP Financial Manager Allison Laflamme at a ceremony during the Vermont Highway Safety Alliance Annual Meeting on November 8. The Governor’s Highway Safety Program facilitates and supports, with federal grants, a statewide network to promote safe driving behavior on Vermont highways. As part of the VTrans family, a main purpose of the GHSP is to save lives through creative, highly visible, innovative, and effective highway safety programs for all modes of transportation. Lockridge inspired and documented the production of a school-wide safety fair at Mt. Abraham Union High School in Bristol, publishing a ‘how-to’ manual so other Vermont schools would be empowered to pursue similar initiatives. The Safety Fair guide can be found at http://www.yscvt.org/safetyfairs/. Lockridge coordinates ‘Turn Off Texting.’ a statewide program that visits high schools to provide a first-hand demonstration of the danger of distracted driving.